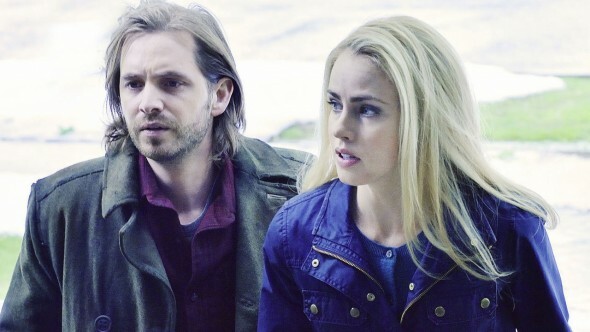 12 Monkeys just debuted its second season last month. But star Aaron Stanford already teased some details to Collider about the season two finale of the Syfy series. The drama centers on James Cole (Stanford), a time-traveler who journeys to the present in order to prevent a massive virus from wiping out the world’s population. Amanda Schull, Kirk Acevedo, Emily Hampshire, Barbara Sukowa, and Tom Noonan also star. What do you think? Do you watch 12 Monkeys? What do you think of season two so far? Season 3 in 3 days of airing is confusing to say the least. Watched 1st 4 and had to go to a site to read what the hell I just watched. The season finale episode was good and it ended with a great cliffhanger. Season 3 story will be interesting and I look forward to it. I have to dvr too and I am not in the demographic by ratings standards. Season 3? With a 0.11 average? Not unless Netflix picks it up. I would be amazed to see NBC Universal renew this with ratings that pathetic. When a 0.00 is snow(as in your line to the network has been severed) a 0.11 is disgraceful. Too bad, because this is a decent show. This is the best show on Syfi. I probably don’t get counted because I DVR and watch later. One of the most brilliantly plotted programs I’ve ever seen. The writing team also goes to the great effort of paying attention to the science — be it cosmology, astro-physics, or biology. It’s a seriously great program! This show is above and beyond quality sci fi, from the script to the production values to the superlative acting .You are going to kick yourself that you waited THIS long to watch. For a taste, check out the 3rd episode of Season 2. See if you don’t get hooked immediately!